Whether it was founded by Ascanius, son of Aeneas, or by Tusco, son of Hercules, as the legends have it, one thing is certain: Tuscania has ancient origins dating to the Bronze Age, and it was a well-established trade centre by Etruscan times (6th century BC). As a result, the countryside around this village of about 8,000 inhabitants is scattered with Etruscan ruins, and not just in the nearby necropolis. Later, Tuscania was among the first towns to embrace Christianity and became a bishop’s seat. In fact, the medieval town centre boasts two gems: the basilicas of San Pietro and Santa Maria Maggiore, both in the Romanesque style. The former is at the top of the hill by the same name, while the latter lies in the valley below. And at the edge of Tuscania stands the striking abbey of San Giusto (12th century). 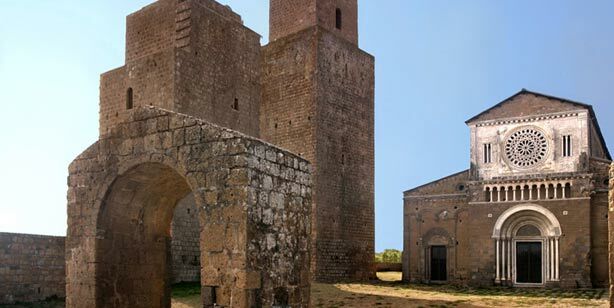 Tuscania is a treasure indeed, and only 23 km from Viterbo. Whether it was founded by Ascanius, son of Aeneas, or by Tusco, son of Hercules, as the legends have it, one thing is certain: Tuscania has ancient origins dating to the Bronze Age, and it was a well-established trade centre by Etruscan times (6th century BC). As a result, the countryside around this village of about 8,000 inhabitants is scattered with Etruscan ruins, and not just in the nearby necropolis.l.